Winnie + I like / I don�t like + food. A varied amount of exercises to discover the USA and New York City. An interesting topic to capture the attention (especially of the boys) in your class. There is a reading about the lives of knights with underlined key words followed by a fill in the blank exercises. I included some video to make the lesson really materialize in their minds. Cheers! 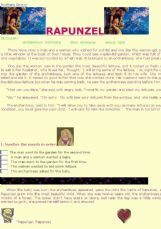 This is the second part of my Holmes OE series. 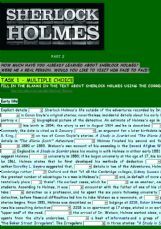 This one contains two tasks - the first one is a multiple choice task with info on Holmes from Wikipedia, and the second one is an open cloze based on listening to the words from the given TV-series trailer. I hope it�s useful to you. An easy reading comprehension and a very short "biography" of a great creator. 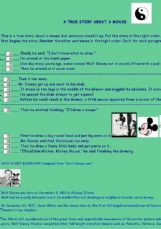 Comprehension "The Lion And The Mouse"
It is a very interesting comprehension with new vocabulary. It has few MCQs and Fill in the blanks using the words used in the passage. I hope children will enjoy doing it.